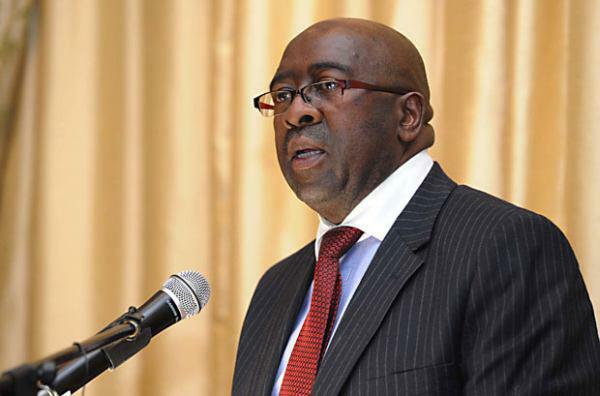 South African Finance Minister Nhlanhla Nene on Wednesday presented his first budget, following through on his October 2014 promise of fiscal consolidation. “I apologise if this budget is boring because we are consistent in our fiscal policy,” Nene said at the embargoed media briefing before the budget. Nene reduced the government’s real gross domestic product (GDP) growth forecast to 2.0 per cent in 2015 from the 2.4 per cent forecast in the October 2014 Medium Term Budget Policy Statement (MTBPS) and the 3.2 per cent forecast in the February 2014 budget. This deterioration in the 2015 growth forecast is in large part due to the electricity supply constraint as the state-owned electricity utility Eskom has had to impose occasional load shedding since a coal storage sile collapsed at the Majuba power station at the beginning of November 2014. Treasury estimates that the lack of electricity supply reduces GDP growth by between 0.3 and 0.6 percentage points. “The 2015 budget is aimed at rebalancing fiscal policy to give greater impetus to investment, to support enterprise development, to promote agriculture and industry and to make our cities engines of growth,” the Finance Minister said in his budget speech on Wednesday. The ruling African National Congress has vowed to create 6 million jobs in the next five years. Growth has slowed to 1.5 per cent in 2014 from 2.2 per cent in 2013 and 2012 as well as 3.2 per cent in 2011 according to Statistics South Africa data released on February 24. Revenue growth is expected to slow to an 8.8 per cent increase in the 2014/15 fiscal year which ends in March 2015 from the 10.6 per cent increase forecast in the February 2014 budget. To raise revenue in the coming fiscal year, the personal income tax rate will be raised by one percentage point for all taxpayers earning more than R181 900 per annum. Taxpayers will however still be compensated for fiscal drag as the tax bracket thresholds are increased. The higher tax rate will bring in a further R9.42 billion, but the fiscal drag relief will return R8.5 billion, so the net impact on tax payers is only an increase of R980 million. There will also be medical credits of R920 million, so the Treasury will only get R60 million extra from individual taxpayers. In addition, there will be a one-off reduction in the Unemployment Insurance Fund (UIF) levy that will reduce the contribution by employers and employees to the fund by R15 billion this fiscal year, but this does not come from government as the UIF is an independent body although controlled by government. The other major revenue increase is from a 30.5 cents per litre rise in the fuel levy which will bring in an additional R6.49 billion. Increases in excise duties on alcohol and tobacco add a further R1.836 billion. Consumers will also have to pay a further 50 cents per litre for the Road Accident Fund, so the total increase in the fuel price is 80.5 cents per litre. The result is that revenue rises by 10.4 per cent to R1.081 trillion. Relative to the expenditure levels announced in the February 2014 budget, government expenditure will be cut by R25 billion over the next two fiscal years. This is only 1 per cent of total expenditure over these two years and will mostly come from delaying the implementation of new programmes. The consolidated budget deficit is forecast to remain steady at 3.9 per cent of GDP in 2015/16 and 2014/15 from 4.1 per cent in 2012/13. It is forecast to ease to 2.6 per cent in 2016/17. Nene pointed out that if there was no fiscal consolidation, then interest payments on government debt would soon exceed transfers to the 16.4 million social assistance beneficiaries. Although the fiscal deficit to GDP ratio is the same in the 2014/15 and 2015/16 fiscal years, the net borrowing requirement is expected to drop to R173.1 billion from R180.9 billion. It is then forecast to fall to only R144 billion in 2016/17. The government intends to issue foreign bonds at the rate of US$1 billion per year over the next few years. It will primarily issue in the currencies in which it has liabilities, so no diversification in terms of foreign currency exposure is expected. The government’s gross exposure to foreign currency loans is less than 10 per cent of total government debt. The main spending priority is on infrastructure and that is expected to grow to R274 billion in 2015/16 from R262.4 billion in 2014/15, R226.9 billion in 2013/14, R217.7 billion in 2012/13 and only R180 billion in 2010/11. The largest portion of the spending by functional classification is on education, which receives a 8.0 per cent increase to R265.7 billion. Health, Social Protection, Local Development and Economic Affairs have similar budgets at R157.3 billion, R155.3 billion, R199.6 billion and R206.2 billion respectively, while Defence receives R49.4 billion and Science and Technology a minimal R7.5 billion and Tourism only R1.8 billion.